I was looking back at a post from years ago because I needed to find an old photo of Layla, and read a few little snippets from her baby-hood. I was shocked because I had written about phases, quirks and stories of Layla the Baby that I have since completely forgotten. This was depressing because I have been terrible about blogging during Noa's life (I'm excellent about Instagramming though! Partial credit? ), and am now wondering what phases of hers I have already forgotten and aren't even on the record for posterity. So here is a post all about Noa, and her first 15 months. Noa can whistle. Like legit whistle. She unintentionally holds her lips in the exact right position (that older children try SO hard to pull off) so that her normal breathing creates a 2 second whistle tone. I first noticed it during her crawling phase (around 7 months) when I was home alone with her and kept hearing whistling. This is alarming when it's just you and a baby in the house. She hadn't been doing it so much lately, but it definitely belongs in the annals of her weird. Noa was the EASIEST infant of all time. She would do cardio smiling most of the day, and when she got tired from that, she would whine a little bit. We learned that this first whine meant that she wanted to be taken to bed immediately with no other to-do. We put her face down, and she would do a move we called "shrink-wrapping" where she would just short of condense in on herself, snuggling her blanket closer, and drawing all her limbs into a little ball. No crying, no looking back, just shrink wrap it, and nap it. Lighting up a room is tiring...better go straight to sleep. That said, she has become the worst sleeping toddler of all our kids. This is 100% our fault as we havent tried even a bit to sleep train her, and since I let her nurse around the clock when we were breastfeeding (which went away after her 13th month and she doesn't even care!...meanwhile I am mourning.). She wakes up 1 or 2 times after going to bed every night. She doesn't want anything in particular--though we sometimes give a bottle (bottles forever, because she's a BABY!). We are, um, in process on that one. Since she and Layla share a room (Noa is in the walk-in closet), crying it out isn't really the same game as it would be if she was alone (though Layla can sleep through a LOT). This storyline is TBD. Noa has the most sophisticated palate of any baby I know. When she was about 8-9 months old and had barely started solids, she seemed interested in Jesse's sea bass risotto one day. Her let her try some and ended up with legit stingy thoughts about how significantly much of his meal she ended up eating/taking from him. She gets incredibly bored with simple foods like yogurt or cheerios, and needs at least one adventurous meal a day. She will snub applesauce and slam farro and soybean salad. The big kids cannot believe she won't join their "team" of picky eaters and are disgusted when they see her downing sundried tomato couscous. Baby is a fiend for kale smoothies. Check out that leg pudge glory. Naturally after eating comes the poop. Like Layla, Noa thinks it's the height of coolness to poop in a brand new diaper. She also poops tiny pellets (and no, shes not dehydrated and she gets plenty of fiber) that look like little nothing-balls, but smell wretched. She's creating like poop's equivalent of bullion cubes. Such concentrated "flavor" in a tiny package. She also is the quickest draw in the west at reaching down during a diaper change and grabbing the open tab of the dirty diaper and whipping it out from under her--sending poop pellets scurrying about. Even when you are ready for this move, you cannot prevent it. Noa is a safety enthusiast. We knew we wouldn't do a baby gate on our stairs, so from the time she could climb them, we started teaching her how to safely go down. Same for disembarking from couches and beds: get on your tummy and scoot back down until your feet hit something solid. She took to this rapidly, and may be guilty of overusing it. if we are walking and there is the slightest downhill slope she turns around, lies on her belly and tries to backward scoot "down" it (even if it is just a 4-inch difference in sea level over 3 linear feet). Any change in altitude = belly scoot. She has begun to loathe her carseat and car rides longer than 10 minutes. This is brand new for us as we have only had kids who were great car riders (including her!) up til now. But we have also never kept a kid backward-facing past a year (b/c Judah and Layla were around before that was like a fully real thing and, I dunno, we are terrible) so maybe it's developmental. Her current carseat is rated up to 30 lbs and she is currently only 22, so we have a long time to go still. That is fine, but the weird thing is that when she is staying with her Grand Dukes, she LOVES the seat and will go crawl into it and immediately fall asleep. Does she do this anywhere else? No. So one night when she was 10 months old, we were hanging out with Jesse's parents after an early date night and Noa was sleepy. So Jesse got her "all set up" in her carseat in the bedroom. After an hour or so I asked him, "you totally buckled her in right?" because, I dunno, she was already walking at this point in life and those things are hard to balance a moving child on without restraint. He was like, "um, no, she passed right out though." I asked him to go check on her and buckle her just in case. He walked in the bedroom and the carseat was empty. So that's a bit startling for him. But there's no sign of her anywhere else either! 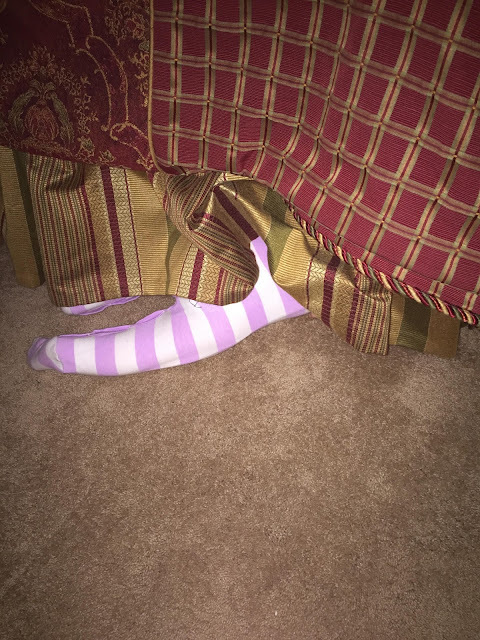 Nerd had gotten out of her seat, crawled under the bed--in the pitch dark, mind you--and fallen soundly asleep. Freaking wonderful! She MAY have a temper. From being the easiest and sweetest little baby, she is now in the running to be the most rage-a-holic older baby in the family. She is just NOT about being told no. I think since she's our magic #3 princess who has always been pampered by everyone, it's kind of a rude awakening to be discovering that her will does not equal law any longer. At the first sign of noncompliance to her wishes, she gets MAD. A completely mad--not sad--baby is a wonder. Seeing her hulk-rage against who or whatever is holding her back is a sight. She can hissy jump her entire high chair across the room if we refuse to let her out of its bonds. If I am holding her while telling her she can't do/have something, she will PINCH ME. It should be interesting to see how this unfolds. This was taken on an airplane after 2 hours in the air sweatily rage-wrestling each other for dominance. A one year old is the worst travel companion: all the motion and will, no dedicated seat or language skills. Noa and I have a strong bond. I don't know if it's the longer breastfeeding, spending more days working from home, being more relaxed and a better mom on my third baby, or just her personality (I suspect its all of those combined), but she makes me feel like more of a mom than either of my other two did by this point. That sounds kinda harsh, but it's true. Because they stopped "needing" me for milk at 5-6 months, it was easy for Judah and Layla to bond elsewhere (re: Jesse) so I didn't get the full measure of that action. And being the broken, flawed person I am, when I feel unloved or un-pursued, I tend to pull back myself (I know this is nuts to do with a baby, but I only realized this in retrospect). I think that led to a bit of a gap in my mommy bond with those two until they were older. With Noa I have never doubted that I am her #1 source of attachment and security and have intentionally leaned in to her even when I don't feel that. She adores Jesse, but I finally feel like the "Oh, she just wants her mama!" thing is actually true, and it has been affirming (and sometimes annoying--Noa, let a lady pee!) to feel so secure in that position. Cant really blame anyone for liking him best, though. She has three teeth. 3. The bottom middle two teeth came in as expected around 6-8 months. 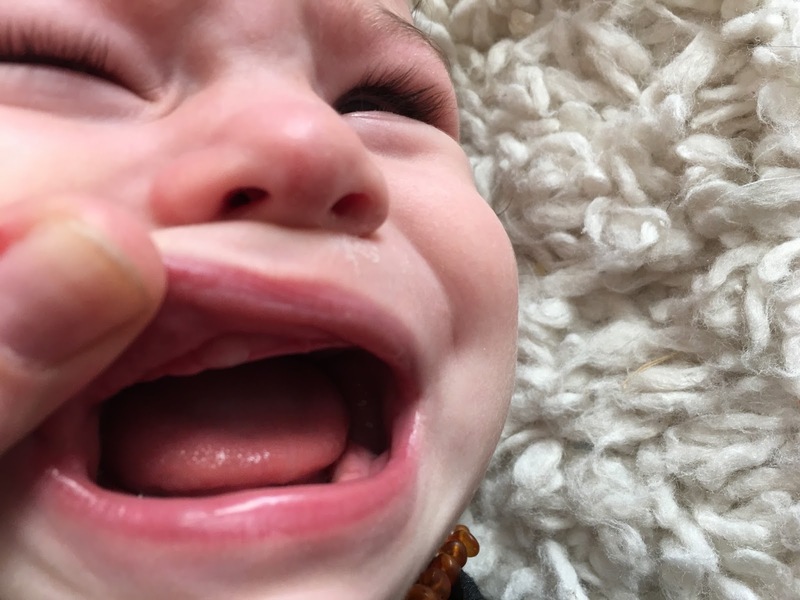 Then nothing until 13 months, and blammo: one tooth. And just like Judah: IT ISNT A MIDDLE TOOTH! It is a single, next-one-over, vampire situation! Unlike Judah, there have been no other teeth following close behind (he had a nice matching set). Poor girl doesn't even have a top-bottom pair that matches up yet. Dark hair. Her entire life. No sign of fair. I am giving it one more summer to lighten up and then I'm ordering a maternity test. I joke. I would love a little baby brunette. I think all 3 kids will end up brown (Jesse started out very blonde his first few years). She is rocking the full on mullet right now with no sign of curls, but can pull of delightful piggie sprout tails. I do think the sun with lighten her up a good bit, but am doubting it will go full blonde. What a world. She has an obession with LaCroix sparkling water. This is Jesse and my every day, 4x a day drink. But kids don't usually love it, much less babies. But she sees that can and is all "WAH-WAH" with grabby hand motions until I put a straw in and let her have some. The bubbles make for interesting reactions since she is utterly surprised by them every time and does this bizarre inside-out-mouth face. This is the same face she makes eating buttered rice: sucking the butter off every grain. Maternity test cancelled: she's OBVIOUSLY mine. Hopefully I have covered enough of her quirks to fill in the rapidly growing brain gaps my old age is providing. This little baby is sweet and feisty and attached and independent and soft and fiere and we cannot wait to see who this delightful potato dumpling is becoming and all the weird phases she goes through on her way! We love you, Noa Lou!